This page presents the M2M (MoHole To the Mantle), a project submitted to IODP in April 2012, to drill the ocean lithosphere down to the upper mantle, and some related material and information. The mid-ocean ridge and oceanic lithosphere community has been involved with the genesis of this project via several workshops and meetings since 2006. The ’MoHole To the Mantle’ (M2M) project will sample for the first time upper mantle peridotites that in the near geological past resided in the convecting mantle, and recently (about 20 to 100 Myrs) underwent partial melting at a fast-spreading mid-ocean ridge. This will be achieved by drilling through intact fast-spread oceanic crust, and about 500m into the mantle lithosphere. This first in-situ sampling of fresh upper mantle rocks will provide unique information on the chemical and isotopic composition (including fluid mobile elements), physico-chemical conditions, seismic velocities and magnetic signatures, physical properties, deformation and rheology, and the scales of chemical and physical heterogeneity of the uppermost mantle. This information is essential to understand the formation and evolution of Earth, its internal heat budget, planetary differentiation and reservoir mixing by mantle convection, mantle melting, and melt focusing and transport at mid-ocean ridges. On the descent to the mantle, an ultradeep borehole (the ’MoHole’) will sample fast spreading ocean crust, and make the first in situ observations of the geological nature of the Mohorovičić Discontinuity (Moho), the uppermost primary seismic boundary in the Earth, assumed to be the crust-mantle boundary. Fast spreading ocean crust is targeted because it exhibits relatively uniform bathymetry and seismic structure, and is the great majority of crust recycled back into the mantle by subduction during the past 200 Myrs. Sampling a section of intact oceanic crust will test models of magmatic accretion at mid-ocean ridges, quantify the geometry and vigor of hydrothermal cooling and geochemical exchanges with the oceans, identify the limits of life in the sub-seafloor biosphere and its functions, and ground-truth remote geophysical observations. Crossing the Moho has been the foremost scientific goal of ocean drilling since the advent of the plate tectonic paradigm in the late 1950s, and was one of the driving forces for the scientific ocean drilling programs of the four decades since. 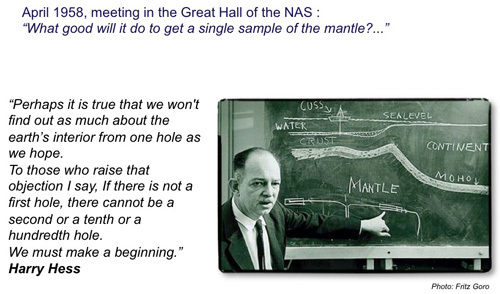 With the new technologies now available to us, for the first time we have the capability of realizing the long-held aspiration of the Geoscience community to drill the ’MoHole’, and sample a complete section of in situ ocean crust and shallow mantle. This is the goal of the M2M project. To achieve this goal is to understand how the surface of the Earth is paved, its internal architecture, and the geodynamic engine of plate tectonics. Observations of pristine upper mantle will transform our understanding of the evolution of our planet and challenge the fundamental paradigms that are the foundations of Earth science. The MoHole, through IODP international partnership, will create, for generations to come, a legacy equivalent to Man’s missions to the Moon. The MoHole workshop was held in Kanazawa in June 2010. The goal was to refine the science objectives of a single ultradeep hole in fast spread ocean crust, and to discuss technology issues and solutions. The integrated Ocean Drilling Program (IODP) and the Deep Carbon Observatory (DCO) co-sponsored "Reaching the Mantle Frontier: Moho and Beyond - A Three-Day Workshop" from 9-11 September 2010. The workshop was held at the Broad Branch Campus of the Carnegie Institution of Washington.